Indonesia has been independent since 1945, after having been the Dutch East Indies for more than 350 years. It is a huge country, stretching along both sides of the Equator for more than 46 degrees of longitude (roughly 5100 km or 3200 miles). Comprised of some 17,000 islands (more than 6000 inhabited islands), it has hundreds of major aids to navigation. Unfortunately, we have no idea how many of these aids can be considered lighthouses. Information about them is scarce, and photos are even scarcer. Official light lists contain dozens of entries for "framework towers" and "white beacons," providing little guidance for the lighthouse fan. Borneo, known as Kalimantan in Indonesia, is the world's third largest island. Most of the island is Indonesian, but the northern portion also includes the Malaysian states of Sarawak and Sabah and the independent sultanate of Brunei. The Indonesian word for a lighthouse is mercusuar. The phrase menara suar, which includes the Arabic word menara, is sometimes used instead. Date unknown. Active; focal plane 47 m (154 ft); white flash every 5 s. White skeletal tower; NGA does not list the height but a tall tower would be required at his location. No photo available; Google has a distant satellite view of the location. Located at the southern tip of Pulau Bunyu, a large island about 35 km (22 mi) northeast of Tarakan. Site open, tower closed. Admiralty F2000.5; NGA 24753. Date unknown. Active; focal plane 55 m (180 ft); white flash every 15 s. Approx. 45 m (148 ft) square skeletal tower with lantern and gallery, painted white; lantern painted red. Deni Sambas has a photo (2nd photo in 4th row), a more distant view is available, and Google has a distant satellite view of the location. Located at the northern tip of Pulau Maratua, a large reef complex in the Celebes Sea about 50 km (30 mi) east of Tanjungbatu. Accessible only by boat. 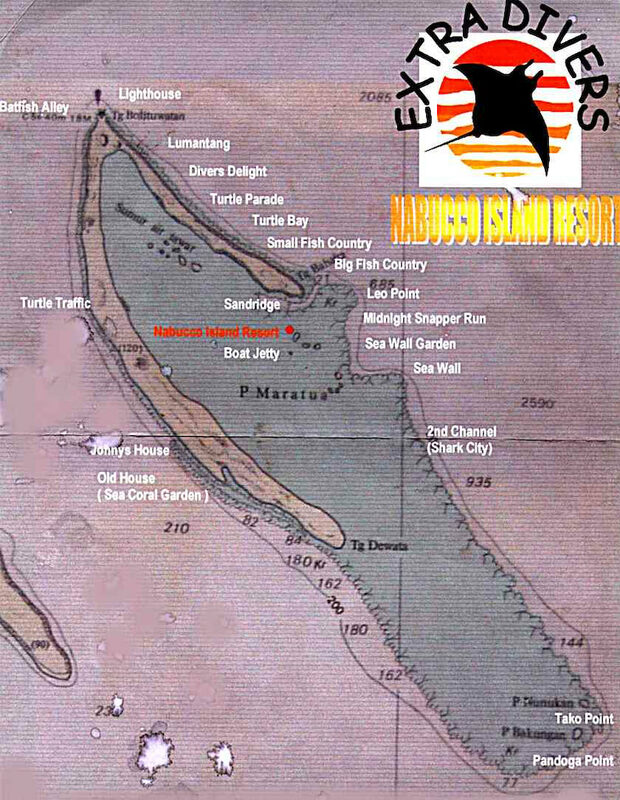 Maratua is a popular scuba diving location; a diving map shows the location of the lighthouse. Site open, tower closed. Admiralty F2015; NGA 24774. Date unknown. Active; focal plane 35 m (115 ft); white flash every 10 s. 30 m (98 ft) "white beacon," according to NGA. A small photo is available, showing what appears to be a concrete lighthouse. Google has a distant satellite view of the location. Located at the southeastern tip of the Maratua reef complex. Accessible only by boat. Site open, tower closed. ARLHS IDO-103; Admiralty F2019; NGA 24775.5. Date unknown. Active; focal plane 13 m (43 ft); white flash every 10 s. 13 m (43 ft) square pyramidal skeletal tower, painted white, mounted on a square platform supported by piles. A photo is at right. Located on a reef about 30 km (19 mi) east of Tanjung Redeb. Accessible only by boat. Site open, tower closed. ARLHS IDO-142; Admiralty F2015.7; NGA 24775. Date unknown (station established 1911). Active; focal plane 43 m (141 ft); white flash every 5 s. 30 m (98 ft) (?) square skeletal tower with lantern and gallery. Tower painted white, lantern and gallery red. Christian Redinger's photo is at the top of this page, but the island is only a blur in Google's satellite view. From the photo, it's apparent that the listed focal plane is too high or else the tower height is too low. Pulau Sambit is a small island in the Celebes Sea about 80 km (50 mi) northeast of Sepinang. The light guides ships approaching the Makassar Strait on the east side of Borneo. Accessible only by boat. Site open, tower closed. ARLHS IDO-032; Admiralty F2022; NGA 24784. Date unknown (station established 1910). Active; focal plane 42 m (138 ft); white flash every 5 s. 33 m (108 ft) iron skeletal tower, painted white. No photo available; Google has a distant satellite view of the location. This lighthouse stands on the easternmost point of Borneo and marks the northern entrance to the Makassar Strait. Site status unknown. ARLHS IDO-043; Admiralty F2024.5; NGA 24788. Date unknown. Active; focal plane 51 m (167 ft); white flash every 6 s. "White lighthouse," according to NGA. No photo available; Google has a distant satellite view of the location. This light marks the entrance to the harbor of Sangkulirang. Accessible only by boat. Site status unknown. ARLHS IDO-223; Admiralty F2024.65; NGA 24792.5. Date unknown. Active; focal plane 25 m (82 ft); two white flashes every 8 s. 25 m (82 ft) "metal structure," according to NGA. No photo available. Located on a reef about 10 km (6 mi) off the central east coast. Accessible only by boat. Site open, tower closed. Admiralty F2024.8; NGA 24796. Date unknown. Active; focal plane 36 m (118 ft); five white flashes, in a 3+2 pattern, every 20.5 s. 35 m (115 ft) square pyramidal skeletal tower with gallery. The tower has been enclosed with metal plates, but some of the plates have fallen off. Arief Rachman's photo is at right, and another photo is available (halfway down the page), as well as a good closeup, and Google has a good satellite view. Beras Basah is a popular resort island almost precisely on the Equator, about 8 km (5 mi) east of the port of Bontang. Located on the beach. Site open, tower closed. Admiralty F2027; NGA 24808. 2007. Active; focal plane 33 m (180 ft); white light, 2 s on, 8 s off. 30 m (98 ft) "white tower." No photo available. Tanjung Tamarong is the easternmost point of the Mahakam river delta. Located (apparently) about 2.5 km (1.5 mi) east of the cape, in which case it is accessible only by boat. Site open, tower closed. Admiralty K1468.46; NGA 24881. Date unknown. Active; focal plane 41 m (135 ft); white flash every 15 s. White skeletal tower; NGA does not list the height but a tall tower would be required at his location. No photo available, and Google has only a very distant satellite view of the location. Located on an island at the south end of the delta of the Mahakam River, which leads to Samarinda, the capital of East Kalimantan. Site status unknown. ARLHS IDO-119; Admiralty K1462; NGA 24846. Date unknown. Active; focal plane 43 m (141 ft); three white flashes every 21 s. 40 m (131 ft) skeletal tower, painted white. No photo available, and Google has only a distant satellite view of the location. Located on a minor cape about 20 km (13 mi) northeast of Balikpapan. Site status unknown. ARLHS IDO-313; Admiralty K1459.8; NGA 24918. Date unknown. Active; focal plane 93 m (305 ft); one long white flash every 20 s. 8 m (26 ft) "white building," according to NGA. No photo available, but a Google satellite view suggests a lantern atop a multistory building. This light marks the entrance to the harbor of Balikpapan, the principal port of East Kalimantan. Site status unknown. ARLHS IDO-362; Admiralty K1459; NGA 24920. Date unknown. Active; focal plane 33 m (108 ft); quick-flashing white light. 30 m (98 ft) skeletal tower, painted white. No photo available, and the island is only a blur in Google's satellite view. Located on an island in Makassar Strait about 130 km (80 mi) southeast of Balikpapan. Accessible only by boat. Site status unknown. ARLHS IDO-190; Admiralty K1488; NGA 24946. Date unknown. Active; focal plane 40 m (131 ft); three white flashes every 20 s. 40 m (131 ft) skeletal tower, painted white. No photo available, and the island is only a blur in Google's satellite view. Located on the southeasternmost of a small group of islands in the middle of the Makassar Strait about 175 km (110 mi) southeast of Balikpapan. Accessible only by boat. Site status unknown. ARLHS IDO-177; Admiralty K1486; NGA 24944. Date unknown. Active; focal plane 32 m (105 ft); white flash every 5 s. 30 m (98 ft) skeletal tower, painted white. No photo available, and the island is only a blur in Google's satellite view. Located on an island in Makassar Strait about 145 km (90 mi) due east of Pulau Laut. Accessible only by boat. Site status unknown. ARLHS IDO-212; Admiralty K1445; NGA 24947. 1901. Active; focal plane 67 m (220 ft); white flash every 5 s. 20 m (66 ft) pyramidal skeletal tower with lantern and gallery, painted white. No current photo available, but KITLV has a distant 1913 photo. A cloud shadow obscures Google's satellite view. It's not certain, but it seems likely that the Dutch lighthouse is still in service. We need confirmation of this. Located on a ridge in Kotabaru, near the northern tip of Pulau Laut. Site status unknown, but the lighthouse must be easy to see from nearby. ARLHS IDO-105; Admiralty K1438.1; NGA 24956. Date unknown (station established 1901). Active; focal plane 19 m (62 ft); white flash every 5 s. 19 m (62 ft) hexagonal cast iron skeletal tower with lantern and gallery, painted white. 1-story keeper's houses. Done Husen has a photo, but Google has only a very distant satellite view of the area. Located near Pagatan, on the west side of the southern entrance to the narrow Laut Strait separating Pulau Laut from the mainland of Borneo. Site status unknown. ARLHS IDO-289; Admiralty K1432; NGA 24964. Date unknown. Active; focal plane 55 m (180 ft); white flash every 5 s. 20 m (66 ft) tapered square skeletal tower with gallery, painted white. Done Husen has a photo, but the island is only a blur in Google's satellite view. Located on an island in the southwestern entrance to the Makassar Strait, about 175 km (110 mi) east of Tanjung Selatan and about 40 km (25 mi) south of the southeastern corner of Borneo at Pulau Laut. Accessible only by boat. Site status unknown. ARLHS IDO-017; Admiralty K1442; NGA 24976. Date unknown (station established 1905). Active; focal plane 34 m (112 ft); one long white flash every 6 s. 30 m (98 ft) hexagonal cast iron tower with lantern and gallery. 1-story keeper's houses. Lighthouse painted white. Done Husen's photo is at right, but Google has only a very distant satellite viewof the cape. Tanjung Selatan (South Cape) is the southernmost point of Borneo. Located on the point of the cape, about 80 km (50 mi) south of Banjarmasin. Site status unknown. ARLHS IDO-328; Admiralty K1422; NGA 24988. Date unknown. Active; focal plane 15 m (49 ft); white flash every 4 s. 15 m (49 ft) skeletal tower, painted white. No photo available, and Google has only a distant satellite view of the location. Located at the end of a spit on the west side of the entrance to the bay of Setriruk. Site status unknown. Admiralty K1411.6; NGA 25032. Date unknown. Active; focal plane 20 m (66 ft); two quick white flashes every 5 s. 15 m (49 ft) skeletal tower, painted white. No photo available, and Google has only a very distant satellite view of the cape. Located on a cape about 25 km (15 mi) southeast of Segintong. Site status unknown. Admiralty K1411.4; NGA 25036. Date unknown. Active; focal plane 31 m (102 ft); three white flashes every 14 s. Approx. 28 m (92 ft) tapered square skeletal tower with gallery, painted white. Done Husen has a photo, but Google has only a very distant satellite view of the cape. Tanjung Putung is a prominent cape about 55 km (35 mi) southwest of Segintong. Site status unknown. Admiralty K1411.2; NGA 25040. Date unknown. Active; focal plane 67 m (220 ft); three white flashes every 12 s. NGA has no description, but a tall tower is likely at this location. No photo available; Google has a very distant satellite view of the cape. Pulau Bawal is an island about 10 km (6 mi) northwest of Tanjung Simbar, the southwestern corner of Borneo. Site status unknown. Admiralty K1410; NGA 25050. Date unknown (station established 1903). Active; focal plane 13 m (43 ft); white flash every 5 s. 20 m (66 ft) skeletal tower, painted with red and white horizontal bands. 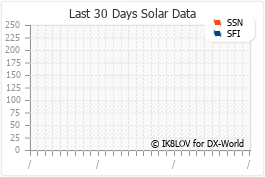 No photo of the current light is available, but KITLV has a 1909 photo of the original Dutch lighthouse. Located on a dangerous reef far out in the northwestern corner of the Java Sea, about 200 km (125 mi) southwest of the southwestern corner of Kalimantan. Accessible only by boat. Site status unknown. ARLHS IDO-132; Admiralty K1034; NGA 25052. Date unknown. Active; focal plane 175 m (574 ft); three quick white flashes every 10 s. 25 m (82 ft) iron skeletal tower, painted white. No current photo available, and Google has only a distant satellite view of the location. KITLV has a 1910 photo of the Dutch lighthouse, which might survive. This is major light with a range of 36 nautical miles (67 km, 42 mi). Pulau Serutu anchors the southwest end of the Karimata Archipelago, which extends into the Karimata Strait separating Kalimantan from Sumatra. The light is an important landmark for ships sailing between Singapore and Jakarta. Located on the highest point of the island. Site status unknown. ARLHS IDO-181; Admiralty K1406; NGA 25060. Date unknown. Active; focal plane 72 m (236 ft); two white flashes every 15 s. 40 m (131 ft) skeletal tower, painted white. No photo available, and Google has only a distant satellite view of the island. 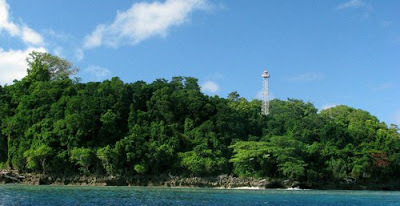 This lighthouse is in Sukadana Bay, a broad embayment on the southwest coast of Kalimantan. Located on a small island about 80 km (50 mi) west of Tanjung Baikbudi. Accessible only by boat. Site status unknown. ARLHS IDO-213; Admiralty K1407.5; NGA 25064.1. Date unknown. Active; focal plane 314 m (1030 ft); three white flashes every 10 s. 19 m (59 ft) skeletal tower, painted white. No photo available, and the tower has not been found in Google's satellite view. Pulau Lemoekoetan is a mountainous island about 18 km (12 mi) off the westernmost point of Kalimantan. Located on the highest point of the island. Accessible only by boat. Site status unknown. ARLHS IDO-214; Admiralty F1885; NGA 25084. 1988 (station establishment date unknown). Active (? ); focal plane 171 m (561 ft); white flash every 15 s. 10 m (33 ft) skeletal tower, painted white. This lighthouse marks the border between Indonesia and Sarawak. Malaysia lists an 8 m (26 ft) round cylindrical concrete tower, and a photo shows that both lighthouses are present. A chain link fence separates the skeletal tower in Indonesia from the concrete lighthouse in Malaysia! We do not know if both lights are active. Located on a promontory at the tip of the Datu Peninsula about 50 km (30 mi) northwest of Sematan, Malaysia. Site status unknown. Admiralty F1894; NGA 23872.